Is this your Lenovo ThinkCentre? Lenovo is recalling more than 50,000 all-in-one desktop PCs due to a fire hazard, the company announced today in cooperation with the U.S. Consumer Product Safety Commission (CPSC). Here's a quick Q&A that Lenovo PC users should read. Which products are being recalled -- and why? Lenovo's ThinkCentre M70z and ThinkCentre M90z desktops, which have a defective component in the power supply. This part can overheat and pose a fire hazard. The recall is voluntary, but Lenovo and the CPSC advise consumers to stop using the PCs immediately. How can I tell if my ThinkCentre model is defective? The M70z and M90z are all-in-one desktops. The PC is integrated into the monitor housing, as is the power supply. 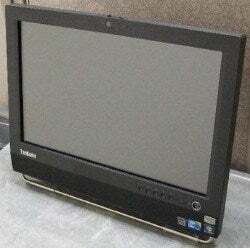 Both models have a matte black finish with the name "ThinkCentre" in the lower left corner of the monitor's front. 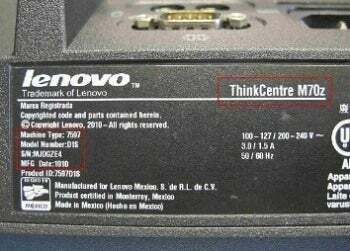 Since only certain M70z and M90z models are affected, you'll need to check your ThinkCentre's serial number and manufacturing date code, which are located on a label on the unit's underside. The CPSC's safety notice lists the recalled models and date codes. Not yet. However, the company has received reports of "one fire incident and one smoke incident" in the U.S. No injuries have been reported. Where were the PCs sold? Lenovo sold them on its website, and via its authorized distributors (phone and direct sales) from May 2010 through January 2012. Priced ranged from about $500 for the M70z to $800 for the M90z. My ThinkCentre is one of the defective models. What do I do next? Stop using the computer and unplug its power supply immediately. Contact Lenovo to schedule an appointment for a free replacement of the power supply. For more information, call Lenovo toll-free at 855-248-2194; or visit the company's website at www.lenovo.com/aiopsurecall.